An iconic Newcastle landmark is celebrating reaching the ripe old age of 90 – with a slice of cake and a facelift. 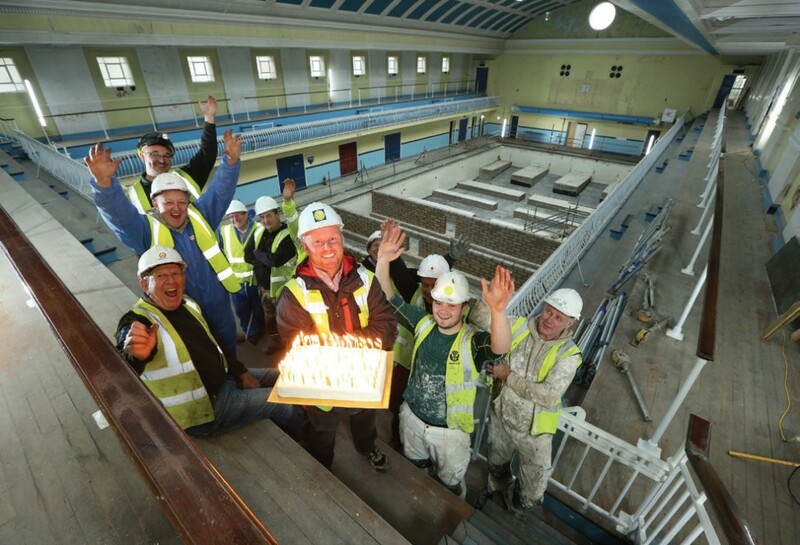 Workers at Newcastle City Pool and Turkish Baths joined in the celebrations, taking a well-deserved break from restoring the building to its former glory, to blow out the 90 candles. The pool and Turkish baths – which holds fond memories for many people – opened in November 1928. The building will be given a new lease of life following a £5m refurbishment by Fusion Lifestyle, a sports and leisure management organisation and registered charity. Even though the building is 90 years old, the history of baths on this site goes back even further, to when famous Newcastle son, John Dobson, built a private baths in 1838 at a cost of £9,500. From 1928 until the early 1960s, the pools were unheated and couldn’t be used for swimming during winter months. Instead they were covered over with temporary flooring and used for dances, be-bopping, boxing, roller-skating and exhibitions. Fusion secured planning permission and listed building consent from Newcastle City Council in 2016 after spotting the historic venue thanks to the community campaign to save the building by the Re-open Newcastle Turkish Baths and City Pool Group.